WordPress widgets are very helpful tools built in to the WordPress application. They allow you to arrange the display of content in your blog sidebar, such as recent posts, and monthly and category archive lists. With widgets, arrange and display the content in the sidebar of your blog without having to know a single bit of PHP or HTML. In this case, Widget areas are the regions in your theme that allow you to insert and arrange content (such as a list of your recent blog posts or links to your favorite sites) or custom menus, by dragging and dropping (and editing) available widgets (shown on the Dashboard’s Widget page) into those corresponding areas. Many widgets offered by WordPress (and those added sometimes by WordPress themes and plugins) provide drag-and-drop installation of more advanced functions normally available only if you write code directly into your theme files. 1Click the Widgets link on the Appearance menu on the Dashboard. The Widgets page displays the available widgets. This feature is a big draw because it lets you control what features you use and where you place them without having to know a lick of code. To explore the Twenty Twelve theme’s widget-ready areas, click the Widgets link on the Appearance menu on the Dashboard. 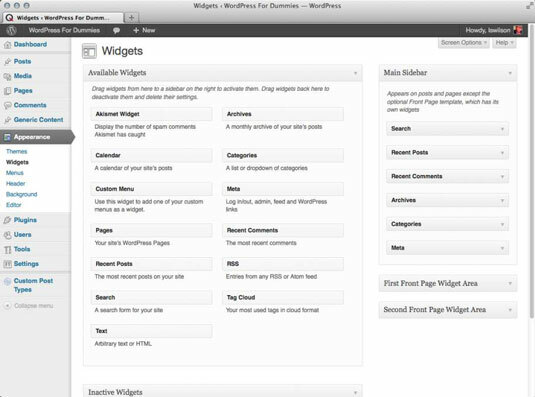 The Widgets page displays modules labeled Main Sidebar, First Front Page Widget Area, and Second Front Page Widget Area. 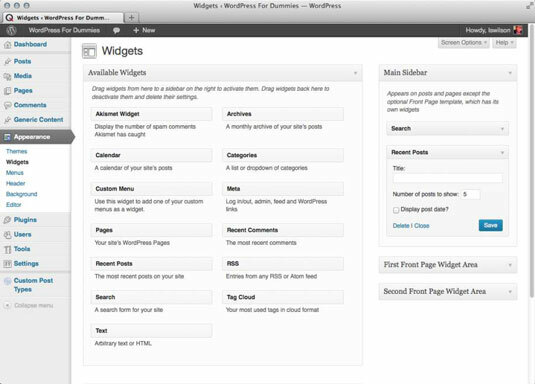 The widget areas that can be edited in the Twenty Twelve theme through the WordPress Dashboard are shown. 2Find the widget you want to use. The widgets are listed in the Available Widgets section. For the purpose of these steps, choose the Recent Posts widget. 3Drag and drop the widget into the Main Sidebar Widget Area section on the right side of the page. The widget is now located in the Main Sidebar Widget Area section, and the content of the widget now appears on your site in the sidebar. 4Click the arrow to the right of the widget title. Options for the widget appear. Each widget has different options that you can configure. The Recent Posts widget, for example, lets you configure the title and the number of recent posts you want to display. The default is set to 5; the maximum allowed is 15. 5Select your options and click the Save button. The options you’ve set are saved. Click the Close link. 6Arrange your widgets in the order you want them to appear on your site by clicking a widget and dragging it above or below another widget. Repeat this step until your widgets are arranged the way you want them.